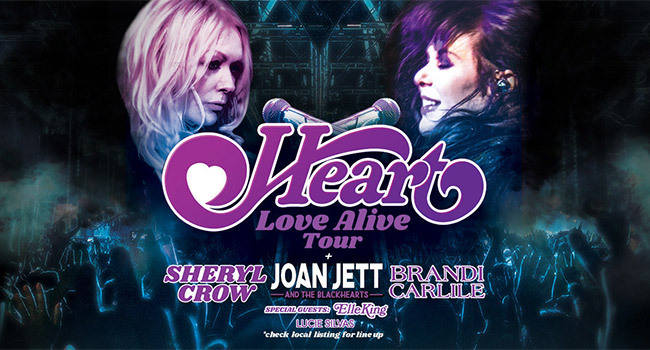 Ann and Nancy Wilson, known as Heart, are returning to the road in 2019 for the first time in three years with their massive Love Alive nationwide summer tour. Produced by Live Nation, the expansive 39 city outing by the trend-setting, multiple-platinum Rock & Roll Hall of Fame legends kicks off Tuesday, July 9th at the Hollywood Casino Amphitheatre in St. Louis, MO and will make stops in Chicago, Atlanta, Houston, Denver and more, before wrapping September 9th at the famous Hollywood Bowl in Los Angeles, CA. Tickets go on sale to the general public beginning Friday, February 15th at 10 am local time at LiveNation.com. * Citi is the official pre-sale credit card for the tour. As such, Citi cardmembers will have access to purchase pre-sale tickets beginning Wednesday, February 13th at 10 am local time until Thursday, February 14th at 10 pm local time through Citi’s Private Pass program. *Toronto on sale starting at 9 am. local time with St. Louis on sale starting at 11 am local time. Heart will partner with Reverb.org for this tour, to reduce the environmental footprint of the events while also engaging fans in local and national causes each night in the concourse.